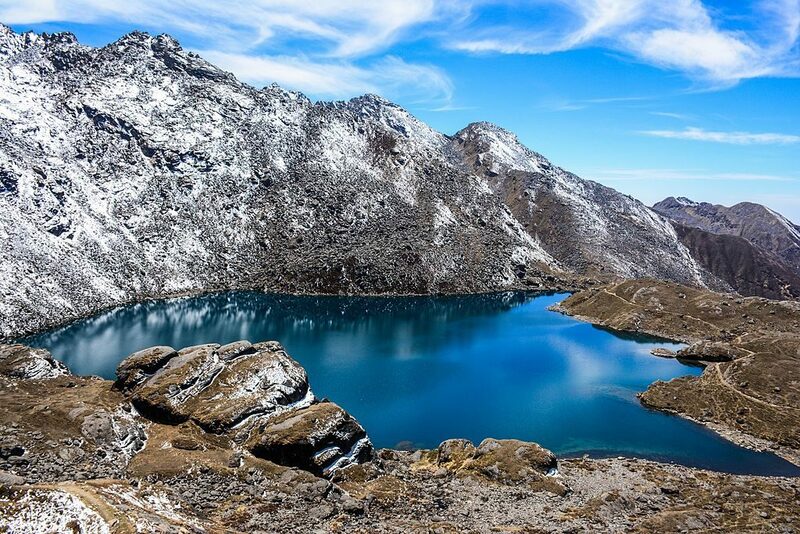 Gosainkunda lake is the headwater of Trishuli River that sits at an elevation of 4,380 meters. It lies to the north of Kathmandu in Langtang Region. The beautiful lake remains frozen for around six months from October to June. The trail leading to Gosaikunda is beautiful. You pass through alpine forests, monasteries and small villages with cheerful locals. The trail flaunts breathtaking Himalayan peaks including Langtang, Dorje Lakpa, Annapurna and more. Gosainkunda trek is a moderate trek offering tea house accommodation throughout the trip. So, you do not have to carry advance trekking gears, accommodation materials, and foods. The region is pretty crowded at the end of the August. Hindu devotees from Nepal and India come to visit this sacred lake in the full moon of August. Apart from that, you will have an easy time getting accommodations. Like other treks of Nepal, Spring and Autumn and are the best seasons for Gosaikunda trek. The Spring trekkers trek to Langtang between late February to early June. Likewise, Autumn Season trekkers trek to Gosaikunda between early September to late December. Skies remain clear and weather is good. Alpine forests and green pasture lands are at their best. And the views of the Himalayas are just breathtaking in these seasons. In the Autumn, the average high temperature ranges between 28 degree 20 degree in Gosaikunda. Likewise, the average low temperature ranges between 10 degree to 6 degree. As the temperature is moderate, Autumn is an ideal season for Gosaikunda trek. This is one of the best seasons for trekkers in the Langtang region. The weather remains pretty clear. It is the perfect time to capture the beautiful Himalayas in your camera lens. You witness breathtaking views of Langtang Lirung, Ganesh, Himalchuli, Dorje Lakpa and more. You walk through valleys, ridges, mountains, highlands, alpine forests, and grasslands. 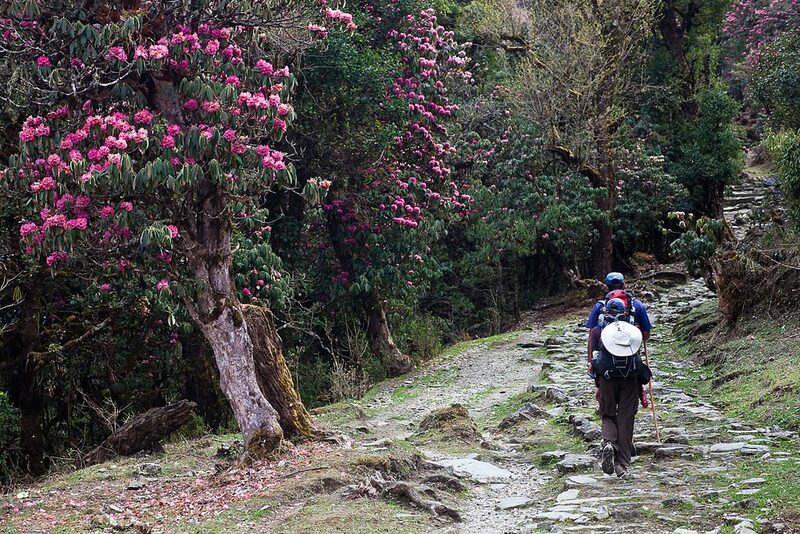 Spring is another ideal season for trekkers in Nepal. During the spring, the entire forest blooms with rhododendrons. It is much pleasing to walk through the forests bloomed with vibrant rhododendrons. Isn’t it? This makes the trekkers enjoy the entire trek. In Gosaikunda, the average high temperature ranges between 18 degree 30 degree in the Spring. Likewise, the average low temperature ranges between 6 degree to 18 degree. Early June also remains a good season to trek. As the weather remains dry until mid-June, you can trek to Gosaikunda in the early or second week of June as well. Apart from the Spring and Autumn, others are off-seasons for treks in Nepal. So, very few trekkers trek to Gosaikunda in Winter and Monsoon. But, Gosaikunda gets a lot of Nepalese and Indian Hindu devotees in the August season. In Gosaikunda, the average high temperature ranges between 18 degree 22 degree in the Winter. Likewise, the average low temperature ranges between 2 degree to 6 degree. The early and mid-December is still a good time for Gosainkunda trek. As the December comes to an end, high-altitude areas start receiving snowfall. Gosaikunda and Lauribinayak Pass are among them. Despite snowfall, the trek is still doable. But, keep in mind that extreme snowfall can block Lauribina Pass. The lake remains frozen in the winter and continues being so for a few months. In Gosaikunda, the average high temperature ranges between 30 degree 22 degree in the Monsoon Season. Likewise, the average low temperature ranges between 17 degree to 21 degree. The lush green grasslands and rhododendron forests make Langtang region attractive in monsoon. But, the start of monsoon from mid or late June cut off the trekkers’ numbers hugely. In the monsoon season, the clouds and rains obstruct the views. And the trails are wet and slippery. August is the time for spiritual trekking to Gosaikunda. The full moon at the end of August is celebrated as “Janai Purnima” festival. In this time, Hindu and Buddhist devotees flock to Gosainkunda. They take a bath in the ice cold water of Gosainkunda and pay homage to Lord Shiva. After a bath, thousands of Hindus pilgrims change a sacred thread “Janai” they wear. Trekking to Gosaikunda during this time has its own significance. Hindu mythology describes Gosaikunda as a holy pond created by Lord Shiva. Hindu devotees believe one can wash away all their wrong deeds by taking a dip in this holy pond. Around 50,000 pilgrims make their way to the sacred lake of Gosaikunda during this time. So, the trek remains pretty crowded. The pilgrims are seen singing Hindu chants and playing instruments. The atmosphere is entertaining. There will also be a few westerners enjoying the culture and festivity of Hindus. There are many tea houses nearby Gosainkunda lake and on the villages, you pass during the trek. But, the facilities are just basic. Extra homestays are also set up during the time. Still, tea houses remain packed during this spiritual Gosaikunda trek time. Prices are also hiked. So, you have to book them early. Or, you can trek to Gosaikunda with tented camps for accommodation. But, be aware that rain is probable in August and the climate is slightly cold there. Since August is a monsoon season, the rain makes the trails wet, muddy and slippery. Usually, build up cloud and rain obstruct the views of amazing landscapes and the majestic Himalayas. Leeches are another problem during this time. There are mainly two routes to Gosaikunda. The first route starts from Dhunche. You can travel to Dhunche via a bus and then trek to Cholangpati or Sing Gompa on the next day. On the next morning, you can trek to Gosaikunda crossing through steep Lauri Binayak pass. After an overnight stay, you can retrace back through the same route in return. While the other route starts from Sundarijal, the trek demands 4 trekking days to reach Gosaikunda. From Gosainkunda, you can trek to Dhunche and then travel to Kathmandu. Or, you can start the trek from Dhunche and end at Sundarijal. Many trekkers also combine Gosainkunda trek with Langtang Valley trek. They trek to Langtang Village and Kyanjin Gompa and return back to Rimche. From there, trekkers ascend to Thulo Syabru. The trek then crosses Phoprang to finally connect to Gosaikunda trek route in Sing Gompa. As there are various trek route options available, you can choose the one you prefer. You can customize Gosaikunda trek itinerary as per your need. The trek takes a minimum of five days or you can extend the trek to more than two weeks. The cost of the trek also varies accordingly. If Gosaikunda trek has lured you, you can contact us. We are a local tour operator with comprehensive knowledge of Langtang region. We help you make your trek easy and avoid any possible problems.